It’s that time of the year again. ClueCon 2017 is right around the corner. From August 7 -10, hundreds of FreeSWITCH developers will gather in Chicago. 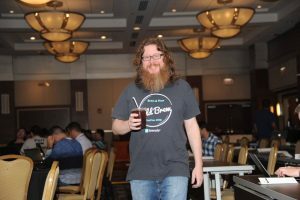 If you are not familiar with ClueCon, the event is all about developing telephony apps; using open source for days, and of course a bunch of phone phreaking. The team from Flowroute will be there serving up Cold Brew again this year and of course talking all things SIP. On Monday, Flowroute is sponsoring a challenge during the Coder Games – Most innovative use of Flowroute in IoT. Over the last couple of years we have seen hackers come up with dating apps that have anonymous calling, mental health apps that will trigger an SMS alert if a person deviates from their typical behavior, and we even had someone hook up Flowroute to a flow meter to track water usage. We’re especially excited to see what the FreeSWITCH community will come up. If you are participating in Coder Games and want to get setup with a Flowroute account, drop us a note and we will add credit to your account. 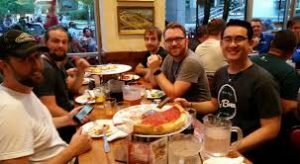 We’re excited to be sponsoring Monday night’s pizza party at Giordano’s again this year. Last year we had a great time and the pizza itself for mind-blowing. The gorging starts at 6:30 PM – We hope to see you all there! On Tuesday, William King will be presenting “How to build scalable, fault tolerant communication services with the HyperNetwork” at 3 PM. He did a precursor a few weeks ago on ClueCon Weekly, check it out if you missed it. William will dive into more technical capabilities of how you can get the most out of the HyperNetwork to ensure the highest level of reliability and redundancy for your communications initiatives. In support of the event, our product team has been working on a number of new tech articles to support the FreeSWITCH community. If you are looking for more information about our APIs, check out our developer resource center. If you are planning to be at the event and want to meet up with Flowroute, drop us a note and we can figure out a time to chat. We look forward to seeing you there!